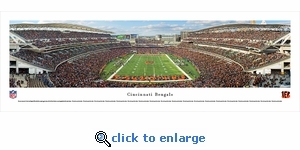 This panorama showcases a Cincinnati Bengals touchdown in front of their home crowd at Paul Brown Stadium. 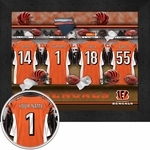 The Cincinnati Bengals joined the American Football League as an expansion team in 1968. By 1970, under direction and guidance of legendary coach Paul Brown, the Bengals won the AFC Central Division to become the first expansion team to win a championship of any kind in just three years. In 1981, sporting a new look, the Cincinnati Bengals advanced to its first of two Super Bowl appearances. Paul Brown Stadium, home venue of the Cincinnati Bengals, is located in the heart of downtown Cincinnati, covers approximately 22 acres and seats 65,535 fans. This panorama was taken by Chris Gjevre.